CHICAGO—Praising the strength and composure the former officer displayed throughout his trial and sentencing, Chicago mayor Rahm Emanuel broke ground Thursday on the city’s newly approved Jason Van Dyke Police Academy. 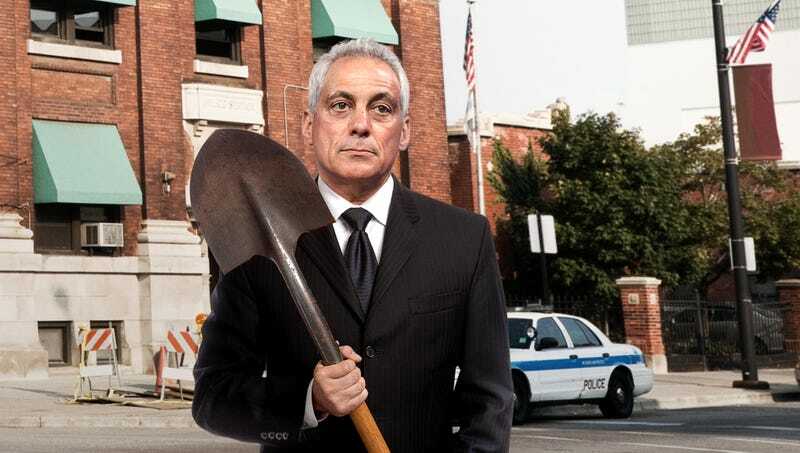 “Today, we remember a brave officer, father, and friend, who was taken from us far too soon when he was sent to prison for seven years for second-degree murder,” said an impassioned Emanuel as he plunged a shovel into the ground, kicking off the sprawling 30-acre, $95-million initiative to improve police training, “the Van Dyke way.” “As a police officer, Jason taught us that sometimes you have to make a choice, stick to your choice, and defend that choice until the very end, no matter what. So, to the thousands of young recruits who will one day pass through here, we hope he can serve as a role model. That legacy will continue for decades to come. Officer Jason Van Dyke truly represents what the Chicago Police Department stands for.” At press time, Emanuel unveiled plans for a new, previously unannounced wing of the academy, a state-of-the-art facility for instructing young officers how to properly cover up a crime.